The Tanglewood Union series guitars are a range of class leading, quality driven Solid top guitars, created to excite and amaze consumers with outstanding value and ultra competitive pricing. 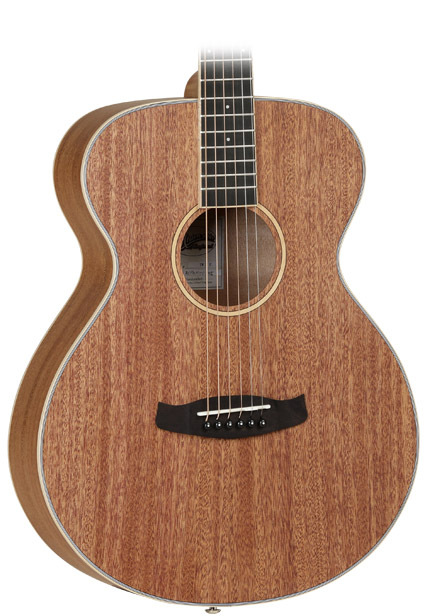 Constructing Union from classic Mahogany tone woods, with premium cosmetic grade Solid African Mahogany tops, each Union model has maple hardwood binding to the body front and headstock, with a maple inlay forming the soundhole rosette. This contrast of rich mahogany and cream maple really makes the guitar stand out visually and we hope will become as iconic for Union and Tanglewood as the Whiskey Barrel finish has been on Crossroads. We’ve chosen a Korean made classic chrome machinehead for precise tuning and a fabulous new rosewood alternative fingerboard material “Eboncore™“. This exciting new material is a contemporary simulated Ebony product which has outstanding cosmetic clarity matched with the robust density of heritage Ebony timber. The Eboncore™ fingerboards will lend ever greater stability to the necks and hold the frets even tighter, giving Union series models class leading intonation and playing actions.